Brown Panther, partly owned by ex-England striker Michael Owen, beat odds-on favourite Hillstar to win the Ormonde Stakes at Chester. The Tom Dascombe-trained six-year-old was having his first run since where he picked up an injury. Brown Panther beat Hillstar by two-and-a-quarter lengths, with Banoffee third. "We went a nice even gallop and he's growing up, it makes my life a lot easier," said jockey Richard Kingscote. Owen said: "I'm surprised that other people are surprised that he's won as he's always the pick of the paddock and he's a great looking horse. 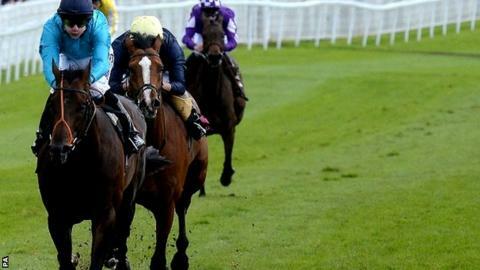 "We mapped out the Ascot Gold Cup as the big early-season target and we thought we might as well come to Chester first. "Everyone knows our love of the track and it's our part of the world. Probably a big, galloping track would be more beneficial to him but he won here as a three-year-old and he was fit. "We'll think about Melbourne again and Champions Day also comes into the equation with a Group Two race, but we'll get the first half of the season out of the way first."